library emails – Super Library Marketing: All kinds of marketing ideas for all kinds of libraries. That’s the spread between the amount my library spends on programming and the amount they spend on collections. I bet if you checked your library, you’d find a similar story. So why, my dear friends, do library marketers spend the majority of their time and effort promoting programs? Please understand me. I’m not saying that library programming isn’t important or worth promoting. Library programs nourish the soul of our community and offer cultural and educational opportunities for those who might not otherwise have access to them. Most library programs are a valuable and important part of the library’s mission to serve the community. And they deserve to be marketed! But most library marketing teams spend their energy and resources promoting those programs. And they miss an undeniably important fact about library usage. Library cardholders want the books. They’re checking out books. That’s why they signed up for a library card! A study by the Pew Research Center published in September 2015 shows 66 percent of library cardholders use their card to borrow books. Only 17 percent attend a library program, class, or lecture. Think about what people say when they sign up a library card. Most are going to tell you they are excited to check stuff out! We take it for granted that people know we have circulation items–books, magazines, music, and more. We need to stop that. If we want to compete with Amazon and other bookstores, we have to promote our main asset–the collection. People are hungry for information about new stuff in the collection. And every time I talk to someone about the library and I mention that we loan eBooks, eAudiobooks and downloadable music, they look at me like I have two heads. We’re spending a ton of money to build our collection and our customers don’t really know it’s there. When they want a newly released book, who do your cardholders think of first–you or Amazon? Before I was a library marketer, I worked as a television news producer. That means I put together each night’s newscast, decided which stories were told, in what order, and how they were told. Every year, our news director would bring in a consulting firm whose job it was to help us improve our shows and increase our viewership. I was proud of my work as a journalist. But when I was presented with the feedback from focus groups, it was clear that most viewers were watching my show for the weather. Hearing what was going on in the world was nice, but what they really wanted to know was whether it would rain the next day. In television news, weather is king. In libraries, the collection is king. Collection marketing is a valuable investment for every library. The best way to market the collection is through targeted emails. In the next few blog posts, I’ll be sharing some secrets for targeted email messaging–things I’ve learned in the 18 months that we’ve done so at my library. But you can start collections marketing right now through social media–especially Twitter and Pinterest– and by featuring books on the front page of your website. Create themed book lists–you can enlist your collections development department for help with that task. Talk about new books and popular books in your podcast or on your blog. For a few minutes every day, spend some time marketing your collection. It will increase circulation and will help reinforce the image of your library as a place of vast resources in the eyes of your cardholders. Make it Damn Near Impossible to Ignore Your Emails! 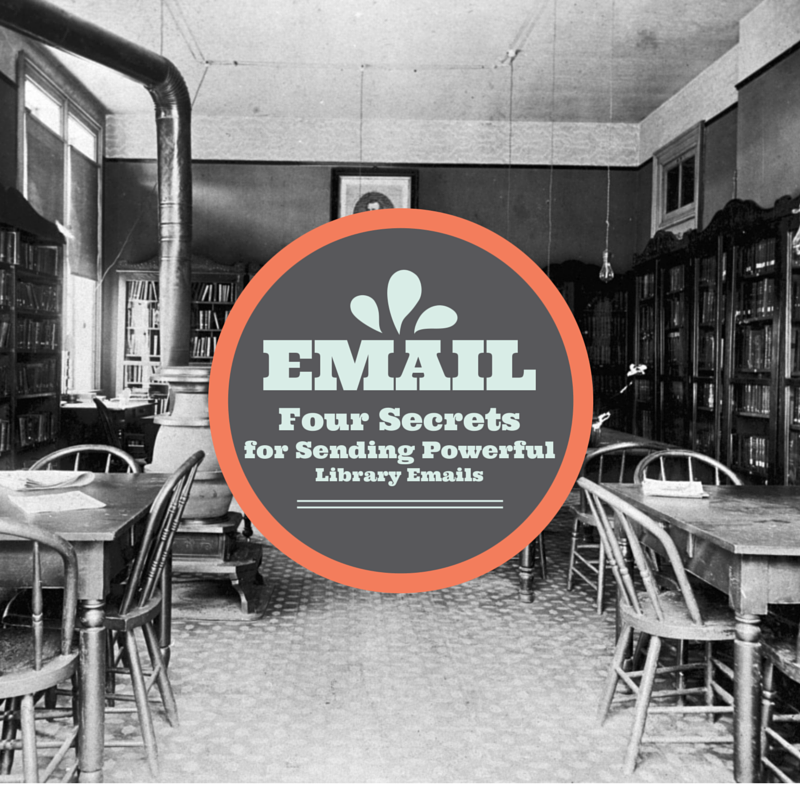 I have to confess that one of my favorite parts of marketing for a library is email marketing. I love the challenge of creating an email with content my cardholders want and need. I love writing a really good subject line that makes it DAMN NEAR IMPOSSIBLE for my cardholders to ignore the message. I want them to be so curious about what’s inside that they click on the email as soon as they see it. Your email subject line is the first–and maybe only–chance you have to hook a reader into opening an email. In a future post, we’ll talk about the actual contents of your email marketing, and how you’ll make that important first click pay off for your cardholders. But for now, let’s concentrate on getting through the door. The Radicati Group, Inc. released a study that shows the average person receives about 90 “business” emails a day. That’s a lot of competition for a little old library with a teeny tiny budget. But don’t you worry. As librarians have done for centuries, we will fight back with words. We’ll use words to create an emotional reaction in our cardholders, which will cause them to take action… by clicking on our email. Here are five best practices to keep in mind when writing your email subject line. Don’t use clichés. Nothing demonstrates a lack of creativity more than a cliché. Clichés are old, they’re unimaginative, and they’re corny. And they’ll make your cardholders groan, not click. What you want to be is clever. A clever email subject line is inventive and intriguing. I endorse cleverness. Hubspot has a great list of examples. My favorites are from the eyeglass company Warby Parker: Uh-oh, your prescription is expiring and from the social media site Buffer, which sent this email after they were hacked: Buffer has been hacked – here is what’s going on. Tease the best feature. What is the one piece of content in your email which your cardholder cannot live without? Find a way to incite curiosity about that one feature. Example: When the video streaming service Indieflix updated their website to include an intuitive movie selection tool, I sent an email with this subject line: New feature helps you pick which free movie to watch. Be current. If you can, invoke a sense of urgency and currency in your email subject line. I try to do this with an email we send once every few months for a book list called Sneak Peeks–books we know we’ll have on our shelves in two-three months. I’ll say something like, Your exclusive first look at new books headed to your Library! or Place the first holds on these new books! You might also tie your email to current events when appropriate. For example, after David Bowie’s death in January, I realized that our cardholders could download or stream his new album through Freegal. So I sent an email with a link to the album and the subject line: New music–including David Bowie’s latest album. Patrons downloaded the album more than 400 times in the three days after the email was sent. Normally, we get 10-15 downloads in that period. Be local. If you can refer to a city, neighborhood, or branch in your subject line, do so. Most of the libraries I know can’t afford personalization software for emails, but we can come close to invoking the feeling of intimacy with our customers by making our subject lines local. Example: You’re invited to a special celebration at the Woodville Branch Library or Author Jon Jones only at the Woodville Branch Library! New books are in–place a hold now! See those first few words? The rest are lost in the formatting of the mobile device. Replacing this subject line with New books are in-read now! might work better. “Listen to new audiobooks from your library!” It’s 43 characters with the action verb and the enticing “new” both visible. BONUS TIP: Every few months, I find the latest list of subject line spam words, print it, and post it in my office. These are words that will trigger spam filters. It’s important to try to avoid these words as much as possible. Here’s the latest list of words to avoid in your subject line. Experiment with subject lines. If you have email software that allows A/B testing, this is a great use of that feature. Beyond that, track your emails. After a few months, you’ll be able to see a pattern with the emails that get the best results and the subject lines and you’ll get a better feel for what works with your cardholders.